A room filled with random people, all sit around a table, some soldering, others sewing trying to repair a set of boots that were supposed to be from leather… which was far from the truth. A disassembled bike in the far corner and three lads, each holding a beer, while discussing the best ways and tools for fixing the dismantled vehicle. The bike will remain in pieces until the next day, and probably, week. The person who was soldering screams: ‘Aha!’ while a motor is functioning again. This is a normal day at one of our Trashlabs, events aimed to build up a community of artists, designers, hackers, makers, re- and up-cyclers and activists, who are all concerned with material and electronic waste in society today. And who all tackle this problem with creative and varied approaches. Pixelache, as an association, has now operated with the Trashlab/Renewable Festivals theme for around six years. The wider scope of introducing the theme in the operating agenda was to gather knowledge and identify learning opportunities related to sustainable, low-carbon, renewable and decentralised production of do-it-ourselves energy. On top of that, it supports diverse attitudes in engaging, thinking and tinkering with waste, from something as simple as mending a button to assembling one's own power bank from waste batteries. The exploration of the theme included uses of waste materials, biomass, kinetic-mechanic, solar and wind sources for electricity, as well as alternative human sustenance in our cultural production models, considering the implications from different angles and as holistically as possible. The theme was first proposed by Antti Ahonen (Pixelache and Koelse.org member) in 2011, initiated and facilitated by Andrew Gryf Paterson as part of the Pixelversity programme and then cemented with the now seminal lecture ‘How I learned to stop worrying and love trash’ by Antti Ahonen in 2012. Since its humble beginnings, the Trashlab events have seen diverse iterations. The Trashlab monthly events (in form of lectures, workshops and seminars) explored experimental art-design-technology practices, between hacker and maker cultures, in the context of re- and up-cycling. At the time the initiative was supported by Aalto Media Factory with in-kind use of the premises of the Aalto Media Factory and staff support. The monthly ‘Talking Trash(lab)’ lecture series approached different topics from maker spaces, clothing design from scrap fabric, to waste management. In the same year, Trashlab was also one of Pixelache Helsinki’s contributions to Alternative Design Capital 2012. On top of that, the Trashlab team participated and organised several workshops: in Polymer Culture Factory (Tallinn), Aalto Media Factory’s Fab Lab (Helsinki), and at the Wasteland Festival (Kouvola). 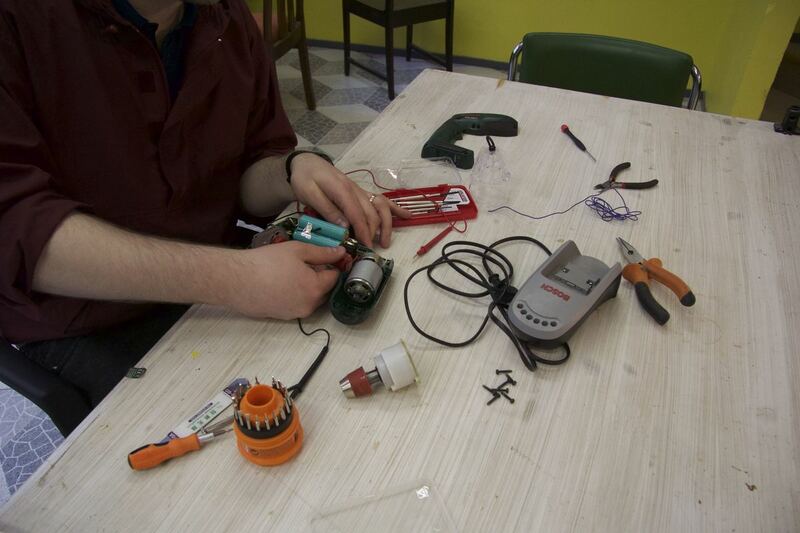 The Trashlabs were later (2013) opened to the wider public with the Trashlab repairing events, a sort of Repair Café type events, which took place in different Helsinki Maker Spaces and other easily accessible spaces. The new approach, modelled on the Dutch ‘Repair Cafés’ was proposed by Päivi Raivio and then facilitated together with Andrew Gryf Paterson. The events were purposefully left open and with varied concepts as to allow a wider participation from the general public, and also to raise awareness of local maker and hacker spaces. The same year has also seen the establishment and the first iteration of the Recycling Olympic Games, generated from the minds of Justin Tyler Tate and Jan Pankovets (both from Error Collective). The Games were held also in 2015 and 2016 and will (hopefully) be again in the future. After the nomadic year, touring different studios and maker­ spaces in Helsinki, the 2014 Trashlab activity settled at Kaupunkiverstas in Lasipalatsi. The monthly events were comprised by Repair Café style events in the newly established Helsinki Library’s Maker Spaces, spaces which were co-planned, also with Trashlabers’ help. Albert Laine, Eero Yli-Vakkuri, Andrew Gryf Paterson and Päivi Raivio representing Trashlab, participated in the co­-planning process of Kaupunkiverstas, during a workshop organised by the city library in Aalto University´s maker­space - Aalto FabLab. The participatory workshops continued in 2015 with supervision by Mikko Laajola, with the collaboration of Sankariliiga - League of Heroes, where the Trashlab events have then taken place. The usual repair events are now also pumped-up by freestyle workshops employing waste material. In 2016 the batton was headed over to our longtime partner, and now also Pixelache member, Justin Tyler Tate, previously already mentioned as one of the instigators of the Recycling Olympic Games. The events are now part of the monthly programming of Temporary (and later Kuusi Palaa), a now-deceased decentralised cultural venue in Helsinki. The year 2017 saw the departure of Justin Tyler Tate as chief-of-operations and all-round-versed organiser, and the wrench has been passed on to Steve Maher and Saša Nemec. The events will continue on a monthly basis (except in the summer) and will first have the familiar form of Repair Cafés opened to the interested public, with the intention to re-establish the monthly lectures, workshops and seminars (started in 2012 and 2013). The already proposed themes and workshops are: Clothes Repair-a-thon, Ameliorating not Buying, Visual Repairing, Textile Mending, Kintsugi, Re-appropriation of Mending, Trash to Treasure, Zero Waste Home and Make not Break. The aim of the process is to distribute open-knowledge and engage in DIY and DIWO informal learning while identifying present and future modes of engaging with the wider community. The events are (still) free of charge and the people participating are encouraged to bring their own broken items for repairing, mending or up-cycling and sometimes for further tinkering with no specific goal in sight. This addresses a wider objective of the events - to think critically about the relationship with our belongings and their (non)disposability. Karthikeya Acharya, Antti Ahonen, Samir Bhowmik, Tommi Flinck, Hannah Harkes, Jukka Hautamäki, Ilpo Heikkinen, Cindy Kohtala, Albert Laine, Mikko Laajola, Steve Maher, Mia Mäkelä, Sara Milazzo, Saša Nemec, Jan Pankovets, Andrew Gryf Paterson, Päivi Raivio, Lotta Remming, Olli Suorlahti, Justin Tyler Tate, Ernest Truely, Eero Yli-Vakkuri, Harri Vähänissi and everyone who ever attended any of the events. In the past six years Trashlab has collaborated with organisations and lecturers from: Koelse (FI), Kokomys (FI), Helsinki City Library and the library Maker Spaces (FI), Aalto Media Factory (FI), Aalto University (FI), Polymer Cultural Factory (EE), Baltic Film & Media School (EE), Wasteland Festival (FI), Vaatevallankumous (FI), de Spullenmannen (NL), Goldsmiths University (UK), Kulturlabor Trial & Error (GE), SHALIN Helsinki ry (FI), Access Space (UK), Aalto Lahti Centre (FI), Reet Aus Design (EE), Wärk Festival (FI), etc.